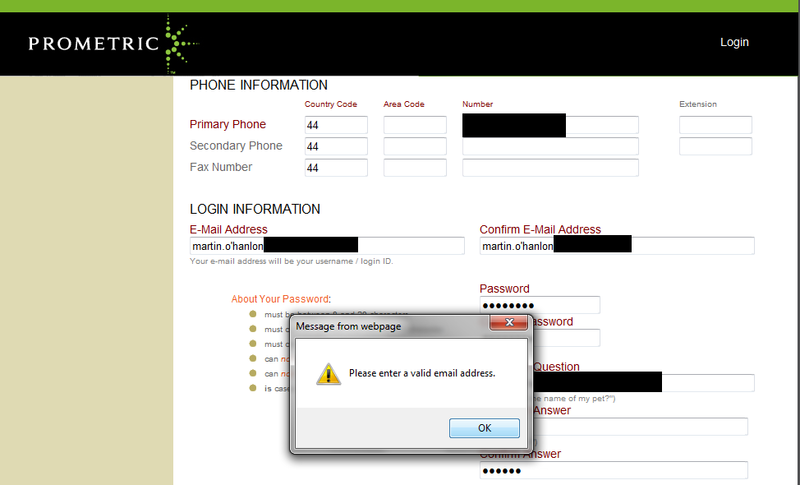 You know what really gets me angry, websites which don't validate email address properly! I have an apostrophe in my surname O'Hanlon and often employers will give me the email address similar to martin.o'hanlon@mycompany.com, all well and good a perfectly respectable email address, which is reflective of my name. This isn't just small company's and little custom website, this issue is prevalent on some BIG companies websites. And its wrong! Its a simple email address regular expression which is missing all sorts of 'unusual' characters / & % and most annoying for me '. Excellent, presumably an apostrophe in email sized hole? This is terrible advice. While it's technically correct that you can have an email address with an apostrophe, doing so is a bad idea. That's because many email servers will not deliver mail to your address because those servers think the apostrophe is invalid. So feel free to have an email address with an apostrophe, but don't complain when you only receive about half the emails sent to you. I, for one, will spare my users that headache by not allowing them to create email addresses with an apostrophe. You know, like the BIG companies do. It seems to me that you need better email servers. If someone can have an apostrophe in their email address it should be supported. Its the validation of web sites which is at fault here not email providers, they are more than happy with an apostrophe and lots of other 'non character' letters. The email spec allows for an apostrophe, so websites should accommodate it period (I mean ' ).